Whew! FINALLY got the web server back online! Sorry for the interruption in service, but thegarret.info server now has a connection to the internet all to itself. It should be much easier to get to the site from now on. What a great site this is, too. Of all the web sites I host, this one is by far the most successful. What a blow-mind. Been on a trip down memory lane on the net and found The Garret!! !My youth just visualized before my eyes. And then going through the pics, finding the Bonny and Clyde Party, which I remember so well and even a photo of me with my good friends Cheryl Thomas and Cathy Singelterry. I couldn't believe it. Would love to get in touch with them for old times sake. Cathy has left an e-mail address that I will write to, but where is Cheryl? For myself, I've been living and working in Germany for the past 32 years, which is more than a long time to not have been in touch with So.Cal. Here's wishing Terrea and Co. all the best and a much overdue "Thank You" for some wonderful times way back then. This is too good to be true! The very mention of "The Garret" brings back a flood of fond memories. This was where I first sang in front of a live audience. I remember Terra, BJ, Stacy and Sue well and of course, "Nino", the guy from Mexico City that charmed us all with his Mexican songs. Always wondered what happend to him? Then there was his side kick, a guy from Italy who always had some new Italian buzz word or phraze for the week. He always had two good looking girls hanging on him, while I had to put up with just one. Then there was Tony Mafia who wrote a lot of his own songs. I was a college student and fledgling night club singer. After doing gigs around town, we would all congregate at the Garret. Terra Lea made us all welcome and created a snug harbor for us Foundlings de Musica. I owned a folk music bar in Santa Barbara (Goleta) in 1965. I heard of your place a visited once. Phil Campos was there, and I hired his group (New Folk Trio) to play in S.B. It was a great weekend, and we even managed to make a few bucks. Somehow, I lost track of the group and to this day, do not know what happened to Phil. I saw some correspondence on your website that indicated he had passed away. Can you shed any light? Thanks for a trip down memory lane. My God! What wonderful memories! The Garret will live on. I'm glad to see some new messages here - and that other fans are finding this site... I'm glad you are not letting it fall off the web. I am hunting for some records, as I was foolish and didn't purchase any of the beautiful Terrea music when I lived there - after all, I only had to go there to here her live, which was the best way.... I'll check this site every so often - now that I see new names are dropping in. on Jefferson Blvd, Los Angeles? I came across your name in news group called "Callahans"
which I just started reading. I'm retired from July 2000 but still keep in touch with several old timers at Citibank, er, Citigroup. Respond if you have the time! I am so excited to have found this site!!! I was a regular from 1962 thru 1966(ish). I knew John Hardy, Kenny Glubin (and his friend Stan), John Coty...and Phil Campos. Can you tell me how Phil died?? I was deeply involved with the happenings of that era...I was 16 when I first discovered Hollywood and the counter culture. You missed one hot-spot - the Chez Paulette on Sunset. Also does anyone remember Andre - I think he was door-person at the Garret. Those were amazing times. And Terrea if you read this...I was the girl with long dark hair who was involved with Phil Campos in 1963, met him at the Garret. Although actually I had more of a crush on the wonderful women there!! Thank you for bringing back these memories!!! I was a long-time devoted fan of Terrea Lea and The Garret. Terrea was one of the finest singers and guitar stylists I ever heard. Is it possible she is around, and I can contact her? We knew each other in Hollywood many years ago when I worked for Southern Music Publishers. I am now retired and living in Florida. I would love to write her. I was a non-regular, but fairly frequent, audience member in the late 60s. I have just learned how to do a web search (finally) and have been plugging in names of old high school friends. "Lacy Bosquez" brought me to your web site. Since I am such an internet-beginner, I am not able to figure out how to contact Lacy (or if she's even the right one, for that matter). If Lacy attended North Hollywood HS (about '64-'67), I'd love to hear from her. Back to your wonderful website: It brought back so many memories. My first reaction was that the picture looked familiar and reminded me of the coffee house my friends and I used to go to. It took a while until I realized this WAS the coffee house. I had completely forgotten the name. Thank you for doing this! And thanks for the memories! I was a Garret regular for a year or two in 1963-1965. I was thrilled to find this site when I checked on Terrea's name for web info. I have enjoyed the last two hours scouring this site - I'm glad someone like you cared to go to such great effort. My thoughts are flooding so fast that I don't know what to highlite from my memories, but, I guess it'll be that I used to make use of the open mike to sing my little parodies while I strummed my baritone uke. My one hit(?) was "This land is Disney's". I am now living back in my home town, Antioch, ILL. I came back and worked 30 years in our local Post Office and am now retired. Thanks again - and I hope I can find a Terrea Lea at the Garret record to purchase... I'm glad she is doing well - Thanks, again...Oh, is my name listed in the regulars list (although misspelled)? Perhaps you got those names from the sign-in sheets on Hoot nights? The Garret Web site has now been in operation for two years and I just renewed its domain name registration for two more. A number of old friends have checked in to visit, but many more are yet to be heard from. We're looking forward to it. Many thanks to all who helped and continue to help make the Web site a success. Looks like it's going to be around for a while. Thanks much, Mary. This site is a labor of love, intended to help former Garret folk find each other. I'm always glad to hear it's working. For those who are wondering what reply Mary is talking about, the Webmaster gets an e-mail copy of everything posted to the Guest Book. Depending on the message and how busy I am, I sometimes reply by e-mail instead of here. I'd love to put up a page about the Garret's Hoot Nights, but have no photos and remember few names. If anyone has pictures of a Garret Hoot and would be willing to loan them, they'd be much appreciated. You have done an outstanding job putting together and maintaining this website and must be commended for all your efforts and time...thank you very much! Its a real treasure trove to those of us who have wondered what became of Terrea and the Garret crowd. I have read and re-read everything here...some of the memories are bittersweet but still a very special part of and time of my life. As Hope would say...thanks for the memories. My memory is not as sharp as it was but I'm sure we would have at least said hello to each other at the Garret from time to time and maybe even enjoyed each other's performances. Keep up the very good work!!! What a joy to find remnants of a happy and important time of my life...about ten years worth actually. 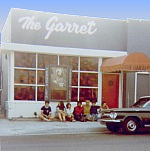 I began going there in 1962 through its closing usually several times a week and introduced many people to the Garret. I also enjoyed performing at the Sunday night Hootenanies and still have my "requests"...many from Terrea herself. So nice to hear she is still going strong and up to her ears in dough. Do hope her music will become available on cd's soon, will be so good to hear her again.! Have any of the other Hootenany people checked in to date? How nice to find this site! Mis-spent my highschool youth in the Garret every Friday nite. I still have the Terrea Lea at the Garret and can make CD's for anyone if Terrea will approve. Anyone have any of the other records.